We live far enough from the city of Marietta to be on a rural route. A rural route carrier does not have to go by the same rules as the city carriers do. Sometimes rural route carriers have to drive their own vehicle to deliver mail, but they are reimbursed for the mileage. A city carrier gets a uniform allowance and has to wear a uniform. A rural route carrier may choose his own fashion, which some look dress like they had the “Apple Annie” look in mind, and some look like they had read too many issues of Vogue or GQ. Regardless how they look, it is the way the mail is delivered that is a big difference in rural route carrier and city carrier. On occasions, especially when a new person is in command, and feels the need to leave his mark – this can be on the local, regional, or national level, will make some kind of new rule. Usually the person making the new rule had no experience carrying mail… they came up the old fashion way, kissing up. When the new procedure rule is implemented it usually slows down the process. And usually after untold amount of overtime is spent on the new procedure management wises up and goes back the old way. I have seen this happen countless number of times. The rural route carriers are not under the same guidelines and just keep on working the old way and quickly comes and goes. Which brings to mind, a rural route carrier is, in a way, under contract. Once a year his or her route is counted and has a route examiner to ride with them several days to determine how long road time is needed and how much casing time. Normally, during casing time and they are being timed they may work a little slower. If they are too quick they might get additional families added to their route but if they are a bit slower they might even get part of their route cut. A rural route carrier, who is a friend, is a honest person. He did not slow down during his count – but he was proud of his speed and how quickly he could finish up his route. After the count his route was adjusted – the hours for it decreased. It cost him annually $2000. Although I have a post office box the rural carrier drive down the street. Sometimes when she sees me working in the yard she will pull over and we talk awhile – tell me some news sometimes. She seems to not be in a hurry. She will be paid the same regardless. She has her route down efficient enough that she makes every move count she can take her own sweet time and still have time to spare. After the route examiners count and measure the routes and things get back to normal, many times some of the rural route carriers are so efficient they are returning from their route before the city carriers even have their vehicles loaded. The rural route carriers do not get paid overtime (except for reasons much over and beyond). They get paid the same whether they do their route in 3 hours or in 12 hours. 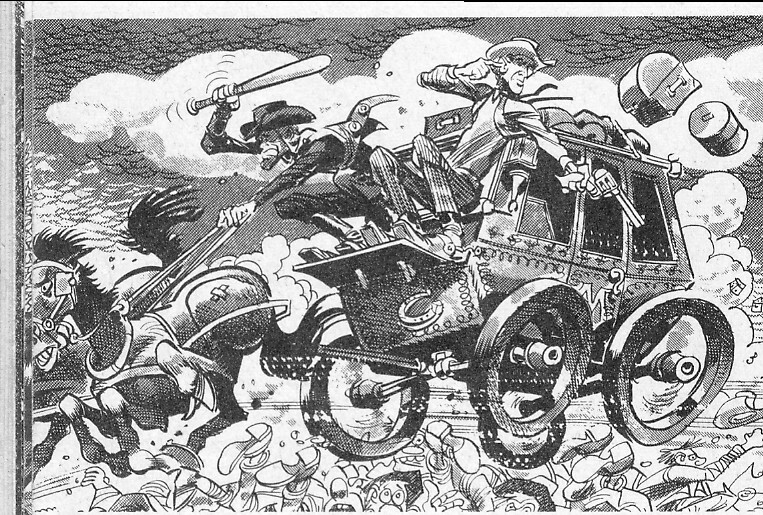 And they is why rural route carriers are very efficient and why city carriers get a lot of overtime. Speaking of people transporting the mail. They Postal Service has what is know as Star Routes. It is a private hauler who transports the mail, usually in a big truck, to little out of the way towns. Usually they have several little town on their route. When I first came to the Postal Service I unloaded and loaded trucks during the night. One night a star route truck did not leave the docks when it was suppose to. A mail handler went looking for the driver to tell him he could go, all was loaded and couldn’t find him. He finally, looked in the back of his truck. He found him lying with sacks of mail dead. I think he died of natural causes. No crime committed or anything. I remember it was a very cold night. Several employees were nosy and went to the truck to look for themselves before an ambulance arrived. People are gruesome. 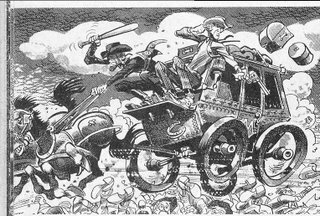 The above stage coach illustrated by Jack Davis was lifted from MAD magazine #24, which so happens to be the first MAD magazine. The first 23 issues were MAD comics. I don't know whether it is better to be a city carrier or a rural carrier, but from what you say - it looks like the rural routes are best. I think a rural route carrier daily proves just how efficient a human can be if they are dealing with their own time... and also how badly management can foul things up, since they don't know the details involved. The postal service fascinates me. If I even know someone who is President, I hope she or he appointments me to be postmaster general. It took me 17 years to get Saturday and Sunday off, so I had a long way to go before I could work myself up to Postmaster General. The main reason city carriers get overtime is because of the huge day-to-day differences in mail volume. Before automation there were days when you could literally spend 10 hours casing the mail-far more that could fit in the case. You took what you could and leave some of the junk. Even with automation of letters there are days when you could probably spend 6 hours casing mail. Yes, you are right, the overtimes does depend on the mail volume. But I have also observed that while overtime was being made by city carriers the rural route carriers finished up much quicker and I think the reason they were not bound by some procedures that the city carriers were.